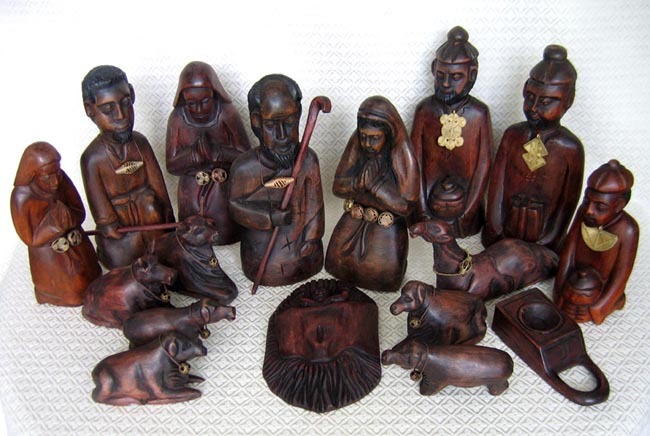 This large Nativity village, made from stained iroko wood, is from Ivory Coast (Côte d’Ivoire). The set contains the Holy Family, a shepherd holding a staff with a lamb by his side, two village women, two oxen, a horse, four sheep, three wise men, and a mystery piece that might be a feed manger for the many animals. The Joseph figure stands 13 inches tall. Each figure wears brass beads or pendant made using the lost-wax method by the Baoule tribe, prolific producers of brass ornaments and charms in Ivory Coast. The lost-wax process of casting dates back to the ninth century. First, a model of the object is made from beeswax. The wax is rolled into thin strips, which are wound into coils or woven into meshes; great skill is needed to create the detail. Next, the completed beeswax model is covered with six layers of fine charcoal dust to preserve the detail, and then coated with clay mud and coconut fiber. As the mold around the wax hardens, channels are left in it to enable the wax to drain out during the heating process. When the clay mold has dried, it is heated in a kiln so the wax melts and runs out. Finally, molten brass is then poured into the mold. When the brass has cooled the mold is broken open, revealing a brand new bead. The rough edges are filed off and the bead is then polished using lemon juice and fine sand. Because each bead is handmade, no two are identical.